We just came back from the border. Some of us managed to get very close to the fence and saw the demonstration on the other side. We spoke via cellphone with few people in Gaza and they told us that there are 20,000-30,000 women demonstrators, which is great. The army shot tear gas and it was very stuffy. We'll try to send pictures and videos later on. There are one million children under the age of 15 in the Gaza Strip. 200,000 boys between the age of 15 and 24. The median age in Gaza is 17. In Gaza, the Youth Dependency Ratio is over 70%. In Israel it is close to 46%. The Literacy Rate in Gaza is high: 97%. As for Water from the tap, 97% is polluted, unfit. So is sea water: people can’t bathe, as it is contaminated, hazardous to health. 100,000 cubic meters of untreated sewage are rejected into the sea every day. Electricity is on 3 to 4 hours daily, at random times night and day. There are 59 km of fences between Gaza and Israel. There are 13 km of fences between Gaza and Egypt. In January 2008, activists broke through the heavy metal fences. Half the population (800,000 at the time) rushed to Egypt, and were driven back after a few days. Check Gaza Border Breach. Since the beginning of 2018, the number of trucks entering Gaza through Kerem Shalom has fallen from 1000 a day (2015-2016) to less than 350, as there is no trade flourishing in Gaza : people just can’t buy anymore. 80% of Gazans live in poverty, 65% under the poverty line. "Gaza cannot and must not be allowed to remain a prison camp," ex British PM Cameron declared, in July 2010, adding: "People in Gaza are living under constant attacks and pressure in an open-air prison". Alaa al-Din al-Araj, the head of the Palestinian Contractors Union in Gaza (...) noted that the authorities are well-aware of the consequences of such a threat, mainly a complete economic shutdown. Araj also stressed that the goal is to put an end to the blockade and the sanctions that have affected every household in Gaza. Khalil Rizk, the head of the Federation of Palestinian Chambers of Commerce, Industry and Agriculture, told Al-Monitor that the federation has been in contact with the PA in an attempt to stop the punitive measures. (...) the number of trucks entering the Gaza Strip through the Kerem Shalom crossing has fallen to less than 350 trucks per day compared to 800-1,000 trucks per day in 2015 and 2016. (...) the PA provides $100 million in total to the Gaza Strip per month, $70 million of which is earmarked for the salaries of government employees. The absence of these funds this month paralyzed the financial cycle in Gaza’s markets and banks. He called on private sector institutions in the West Bank to support their counterparts in Gaza by taking steps to pressure the Palestinian officials to back down from the punitive measures against the Gaza Strip. My asthmatic younger brother, Salah 18, is scheduled for an urgent eye operation in Egypt, without which he might permanently lose the sight in his right eye. He’s also been awarded a scholarship to study in Algeria, and has been fighting to get out of the Gaza Strip to take up his place for nearly two years, without success. His life is being entirely stolen from him by Israel's blockade, yet his future stares back at him just a footstep away, from behind the giant concrete walls that seal Gaza. He’s in a race against time not to lose his sight, his mind, and his life as well. Almost every day, my brother shows up for the Gaza "Great Return March," although my mother has desperately tried almost everything to stop him from running bare-chested towards his death. The border protests are the only place where it feels that he’s at least doing something about his own slow death, even if only to scream at the top of his lungs, telling the world "We are here!" It’s the only place where he and all of my friends in Gaza can catch a breath of freedom, despite the stinging tear gas, even if it's just for a moment. Hamas has deployed its security and intelligence personnel to maintain what it sees as the three critical parameters of the protest: independence, non-violence, and no breach of the fence into Israel. The security forces are assigned to prevent individual attempts to disrupt the protest’s non-violence, such as young people trying to throw molotov cocktails towards Israel. Some cases slip their attention; others are dealt with firmly. Last Friday, my brother accidentally walked into a tent where the wounded were being attended to. He and his friends were dragged into interrogations by Palestinian internal security personnel for taking photos of the tent and for holding spontaneous interviews with the wounded. Hamas, despite remaining dismissive of the protest’s ability to challenge Israel’s blockade, has, like all political parties would have done, jumped with alacrity into the protests to accrue political capital, recognizing the backdrop as an opportune moment for photoshoots, for fueling popular support and to advance its vested interests. When Israel responds to the protests with violence, Hamas cheers those dramatic photographs' ability to return Gaza to world headlines, and to concentrate the people’s anger on Israel and its "complicit partner," the Palestinian Authority. Hamas hopes the protest will go some way to counter the pressure that's been ramping up since the assassination attempt on Palestinian Prime Minister Rami Hamdallah. The Palestinian Authority initially blamed Hamas for the explosion which targeted Hamdallah's convoy as he was visiting Gaza. Palestinian President Mahmoud Abbas then threatened to impose even more severe sanctions on Gaza than those that already make the enclave unlivable. Hamas hopes the protests will convince Abbas to give the reconciliation a second chance and avoid being blamed by Israel for pouring more fuel into Gaza’s imminent explosion. Hamas is also calculating that both Israel and Egypt are watching how swiftly and easily it's mobilized the masses. That's in order that Israel might put pressure on Egypt to ease its part of the blockade to assuage popular tension and anger. It would be a mistake for onlookers to assume that Hamas’ hijacking of the protest undermines its authenticity and the genuine pain of Gazans. Yes, the protests are being pushed hard, by blanket promotions in street talks, schools, mosques, universities, shops and on taxies, the pictures of Ismail Haniya playing football close to the border, Yahya Sinwar’s inflammatory speeches, and Hamas paying $3000 to the families of the dead (despite the organization itself receiving the tenfold that amount). But Hamas cannot drag young people out of bed at gunpoint and shuttle them to the borders to dance to its tune. Young Gazans are making their way there by their own free will. Was it not for the misery inflicted by Gaza's status quo, no one would show up for that date with death. Although some have joined out of mere curiosity, to see an area they never dared to step foot in before, and others joined out of national pride, or to simply take photos, many of the people present felt they had to participate in the march to challenge their sense of their own slow and painful deaths. Every protestor has a heartbreaking story and a profound reason to stand in front of immediate danger, unarmed. Gazans have been living on the edge of death, starvation and collapse for 11 years, pushing the boundaries for human survival. These grievances can never be faked, and they must be addressed. Despite the evident danger, my brother, like most people I know in Gaza, is going to keep showing up at the protests every day, until he perishes - or breaks free. "The Other Voice" is a grassroots movement founded by Israelis living in the town of Sderot and other locations near the Gaza Strip border. The aim of "The Other Voice" is to reach out to the Gaza Palestinians, to promote peaceful dialogue and call for an end to the siege of the Gaza Strip and the occupation and oppression of the Palestinians in general. Members of "The Other Voice" maintain ongoing personal contacts with Gaza Strip Palestinians, unbroken even in periods of high tensions, violence and bloodshed. It is virtually impossible to have face-to-face meetings since Gaza Palestinians are virtually never allowed to enter Israel and Israeli citizens similarly are forbidden to enter Gaza; still, it is possible to maintain contact, across the high physical and mental barriers, by phone and the net. The activities of "The Other Voice" are far from easy, in the Gaza border area there live some aggressive nationalists. Expressing peace-oriented opinions in this environment is more difficult than in the (relatively) liberal Tel Aviv. Still, the activists persist in holding weekly vigils every Friday at the Yad Morderchai Junction, a short distance north of the Erez Checkpoint at the (blocked) entrance to the Gaza Strip. The junction is bustling with traffic, both civilians and soldiers en route to the Gaza border, and activists are highly visible when they raise placards and banners with such slogans as "End the Violence - rebuild Gaza!" and "On Both Sides of the Border, Children Want to Live!". There are sympathetic reactions from passers-by and motorists, but also some highly hostile ones, including several instances of physical violence. Members of "The Other Voice" are not deterred by any such ugly incidents, and are determined to raise their voice, The Other Voice in very truth, as high as possible. For the Israeli Peace Movement as a whole, this voice is of special importance - since Israelis who live in the close proximity of the Gaza border have a special moral authority, position in the Israeli society, as being those who will likely personally bear the dire results of any new violent flareup. Their outspoken call, to halt the violence and oppression and solve the deep humanitarian and political problems of Gaza has a greater resonance than a call by Israelis living elsewhere. Expressions of solidarity and goodwill, made by people worldwide, are highly appreciated and strengthening. You can help by raising the issue in your own country, reaching out to decision-makers and the general public opinion. Relations between Israelis and Palestinians have long since stopped being their own exclusive concern. People and governments from all over the world are involved - and should be involved in the right way. Over the past six weeks, nearly 100 men, women, and children have been killed in the protests along Gaza’s border with Israel. Over 11,000 more have been injured. One thing is absolutely certain about the latest crisis in Gaza – the status quo is failing. As a sitting Congressman and a physician, our work has collectively taken us to Gaza more than five times. We’ve seen firsthand the devastation and poverty that the siege on Gaza has wrought. The humanitarian situation is extremely grave. Only those who have little to lose would willingly approach the border with Israel, knowing they are likely to be injured or killed. At the same time, the situation is complex and there is much blame to share. All of the major players have made decisions and taken steps to enhance their own interests while most of the almost two million Palestinians who live in Gaza are powerless victims caught in the middle. It is important to remember that Israel has real security interests at stake in Gaza. Hamas has an arsenal of rockets and missiles, as well as sophisticated tunnels that threaten Israeli civilians. 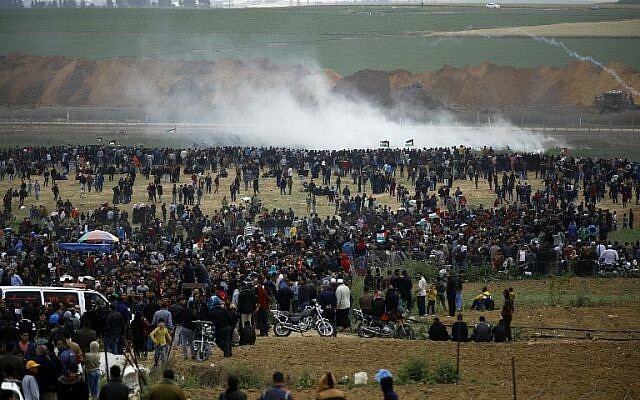 Likewise, we must remember that Hamas is exploiting the desperation of their own people in an attempt to inject violence into the border demonstrations. But that does not justify using live fire against unarmed protesters or blockading the entire population for years on end. Any serious attempt at peace between Israel and Palestine must start with fully funding the United Nations Relief and Works Agency (UNRWA), the agency that provides humanitarian assistance, food, health care, education and emergency assistance to Palestine refugees in Jordan, Lebanon, Syria and the Palestinian territories. Even Israeli security officials advocate for UNRWA funding because they see it as important to Israel’s security and well-being. UNRWA provides the basic stability needed for a peace deal to be negotiated. But the latest crisis in Gaza cannot be resolved just by funding UNRWA. There are also the energy and water crises that must be dealt with. Gazans survive on as little as four hours of electricity per day, which disrupts basic services such as water and sanitation services. Due to the lack of energy, Gaza’s facilities that could help reduce the sewage aren’t running near capacity. More than 100 million liters, the equivalent of 40 Olympic-size swimming pools, of raw sewage enters the Mediterranean Sea daily and contaminates both Gaza’s beaches and Israel’s coastal cities. In addition, nearly two-thirds of Gazans have no running water and up to 97 percent of the running water in Gaza is too polluted to drink. This humanitarian crisis could easily devolve into a serious public health crisis, like a cholera epidemic, that political borders cannot contain. Israel and the Palestinian authority must work together to ensure sufficient energy and water flows to Gaza. We believe that the status quo is unsustainable – the blockade on Gaza, which Israel and Egypt have maintained for nearly 12 years, needs to change. The blockade has devastated Gaza’s economy and private sector: unemployment is 43.6 percent. Gaza’s youth are particularly devastated, with around 65 percent unemployed and few opportunities to build careers. The supply of food and consumer goods allowed to enter Gaza following inspection should be significantly increased to meet the population's most basic needs. Real change can only be created by opening Gaza to the outside world, which must be done carefully with the full participation of the Palestinian, Egyptian, and Israeli authorities. Crossing points must be secured and the tunnels should be destroyed. The possibility of constructing a port for Gaza should also be explored. These actions would weaken Hamas’s ability to strike at Israel and diminish Hamas’ resources, while also mitigating some of the desperation among the residents of Gaza. The way things are now, additional tragic loss of life is almost guaranteed. The international community must take action. "When senior officials of the Palestinian Authority, particularly Mahmoud Abbas, speak about the “State of Palestine,” which has been recognized by the United Nations, it includes the Gaza Strip. Gaza is needed for their political narrative, but in practice those officials show indifference to the fate of Gaza’s citizens. A shortage of 40 percent of the medicines in Gaza’s public health system is not a divine decree. Hamas and Gaza’s residents are right to accuse the Palestinian Authority of deliberately delaying shipments of medicine to pressure Hamas. This is not politically wise, either. Gazans openly criticize the Palestinian Authority, not Hamas. The delay of shipments of medicine is not economically wise. Instead of patients being treated in the Gaza Strip, they are belatedly referred for treatment outside. The Palestinian Authority pays, and the cost comes to dozens of times the price of the medicines. What folly! Instead of competing over who’s first at burning out medical personnel and cutting their salaries, maybe the leadership of each of the two Palestinian factions could engage in the opposite kind of competition: over who’s first at raising the salaries of medical teams out of recognition of the importance of their work, and their diligence and dedication over the years, for which they have not been rewarded? Sosebee said a French volunteer physician came away with the impression that all doctors in the Gaza Strip are depressed; Sosebee called it an epidemic of depression. The doctors know exactly how to treat their patients but they don’t have the means. It’s a depression that’s unconnected to the partial salaries they receive, and it goes beyond the depression of two million imprisoned residents who can’t come and go from the Strip in freedom." Mass protest in Gaza amid electricity crisis "There is no work, no crossings, no food, no water to drink and also there is no electricity,"